A photo book is the next evolution of the photo album using your digital photos. A photo book can celebrate a new baby, a wedding or engagement party or other family events, including vacations. Once you create a photo book, you can print copies on demand, and have them shipped directly to friends and family all over the world. First, User can select photos from his device As Mobile, PC etc. Now user has to select the book size and cover from different layouts available there. User will select a background theme for pages. Now user can add photos, text, background, arrange pages, make changes in page layouts and many more. User can see the preview of photobook. This book is ready to add in cart now. Technologies: Core PHP, MYSQL, Instagram API, Social Plugin, Bendigo bank and Paypal Payment Integration, Advance Jquery, Light box, PDF creation(tcpdf,mpdf). Description: User can create photo book online with comments from instagram photos. Technologies: Core PHP, MYSQL, Image Magic, Instagram API, Social Plugin, Bendigo bank and PayPal payment integration, advance jquery, lightbox. Description: This project is for creating Facebook friend, Album or Group poster. The site automatically gathers all the profile pictures of your facebook friends. When the customer enter coupon code and shipping address, the site will creating Facebook poster and send to shipping address. Technologies: Core PHP, MYSQL, Image Magic, Facebook Graph API, Social Plugin, Bendigo bank and PayPal Payment Integration, Advance Jquery, Light box. Description: A user can create poster from his Album Photos, Friends Profile Pictures, Friends Album Photos and directly from computer. 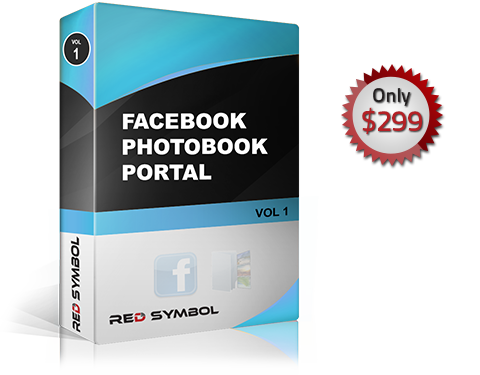 Description: User can create photobook online with comments from facebook album. User can also create photobook from his friend’s album. Red Symbol approach is to take your project, and break it up into modules to quickly decide on your exact requirements. We will then build a quote, and a project plan after the work is agreed on.